Victor Wray (right), PRO for the City Grand Orange Lodge, with Mr and Mrs Ann and Wilson Sherrard, making UK City of Culture collarettes at a City Grand Lodge workshop in the Playhouse. INLS 1324-502MT. The City of Londonderry Grand Orange Lodge has paid tribute to the Late Wilson Sherrard, a member of LOL858, who died following a tragic accident on Tuesday night at Foreglen on the outskirts of the city. Press Officer for the City Grand Lodge, Bro Victor Wray, said on behalf of the City Grand Lodge Grand Master and Officers, he wished to express deepest sympathy and condolences to the family of the Late Bro Sherrard, and extend their best wishes for a speedy recovery to all those injured in the tragedy. “It was with great sadness and regret that the City of Londonderry Grand Orange Lodge learned of the death of Bro Wilson Sherrard,” he said. “Wilson was a great friend to all in the Loyal Orders, and developed a profitable business making collarettes and regalia not only for the Brethren in Londonderry, but across the Province and in Scotland and England, as well as the Republic of Ireland. “Unperturbed by being made redundant, he was a man who had a great passion for making regalia and turned that into a business venture was only one way in which he displayed an innate sense of initiative and intelligence. “We will all miss him a great deal. During the UK City of Culture Year he played an integral part in promoting Orange Culture and the historic heritage of this great city. I had the privilege of working with him on a Culture Project during the City of Culture Year in 20013, facilitating workshops in the Playhouse, where for the first time ever we encouraged and welcomed members of the public to come and watch Orange Order regalia being made. “Both Wilson and his wife Ann, and their family took part wholeheartedly in the project, and we very much hope that the Sherrard family association with this tradition of regalia making in the city will continue. 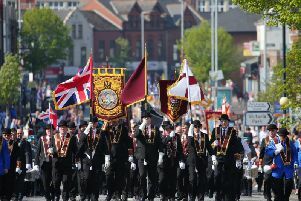 “Wilson was a member of LOL858 as well as a member of the Browning Club, and was an ardent supporter of both, attending parades and either taking part or supporting from the sidelines. His myriad of skills were such that if anyone needed equipment or there was something to be fixed, Wilson was first in line to sort it out. “The City of Londonderry Grand Master and Officers extend our deepest sympathy to the Sherrard family at this sad time. “We also extend our best wishes for a speedy recovery to those other people who were also injured in the accident on Tuesday night and wish them well,” he said.